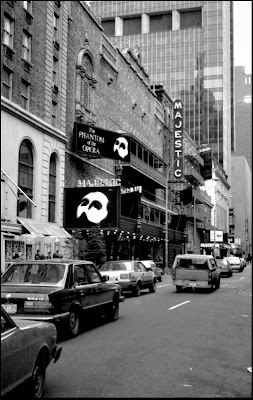 Since January of 1988 there has not been a show running at the Majestic Theater that wasn't called Phantom of the Opera. When the first of the pictures above was taken, the curtain had gone up and the chandelier had come down only a few dozen times on this musical. Now, the show sets the Broadway record for longevity every single night, and it doesn't seem like it will ever go away. January 28, 2008 marks the twentieth year of this run, an incredible 25% of the time the building itself has been open. The theater has been here since 1927, one of three theaters and a hotel in the neighborhood that was built for the Chanin Brothers by Herbert J. Krapp, a prominent theater designer of the early twentieth century. Krapp was responsible for over a dozen other Broadway houses as well as another hotel. 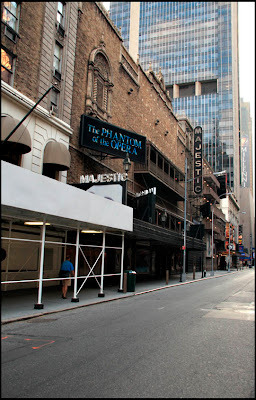 The Shubert brothers took over the Majestic after the market crash of 1929, and it is managed by the Shubert Organization to this day. The adjacent Lincoln Hotel later became the Milford Plaza, a part of which is covered by the white scaffolding in the current photo. The glass wall looming in the background of both pictures is the Astor Plaza Building. One of the places where time seems to have stood still in this rapidly churning town. It took a few moments prior to reading the text to realize that, in fact, it's Phantom Forever. That made me smile somehow. What ever happened to the Fantastiks?